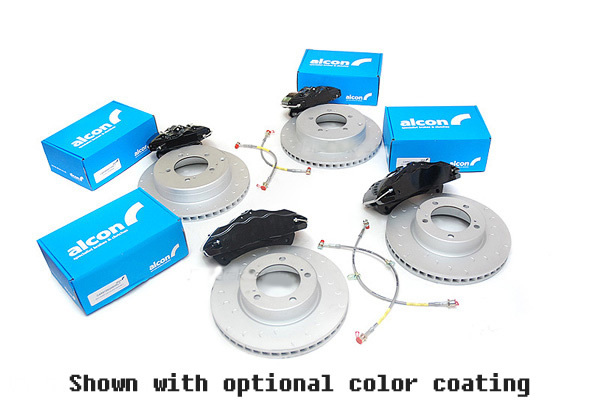 Alcon Armored/Off-Road Toyota LC200 complete brake kit. 6 piston front and 4 piston rear calipers with 355mm x 36mm and 370mm x 28mm rotors. 45% reduced brake temperature for more reliable stops in heavy duty applications. Suitable for applications up to 12,700 lbs. 10% increase in brake torque. FOUR piston rear calipers 34.9mm ea. Rear 370mm (14.5") x 28mm (1.2mm) rotors internally vented. Note: 2007-2015 models use a seperate bracket kit - included. Please specify year in order comments.